At a United Plant Savers Conference in Rhode Island, Susun Weed spoke on the wonders of Stinging Nettles ( Urtica dioica ), or Sister Spinster as she calls it in her book Healing Wise. Her main focus was on its energy-restoring properties. The results sounded like bliss: Wake up in the morning feeling energized, and maintain that energy throughout the day. This is going to be big, this is going to need time, this can be our future. Nettles – 2011. Au revoir, cafe. Oh hello Nettles! I actually began this Experimence in the Fall of 2010, harvesting mowed-Nettles regrowth. It is best to get the small young Nettles or the fragile tops on mowed/cut plants (as I have done). This is due to the difference in attributes between young and old Nettles. Many will agree that the older leaves are tougher and have a less desirable taste. I remember hearing that the minerals become somewhat inaccessible at the later stage of growth…correct me if I’m wrong. I walked through the fertile meadows once a week to gather the Nettles. 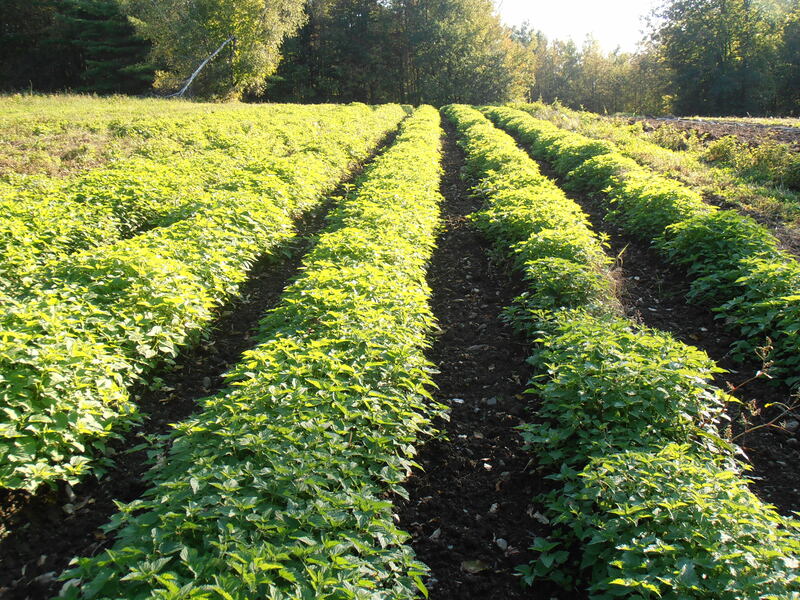 They prefer to grow in very healthy soil, just as her healing makes you a healthy, mineral-rich person. I placed them in one-layer along the bottom of a crate with wide air holes to let them dry. I would toss them about every other day to avoid concentrations of moisture, which could eventually lead to mold. You need lots of air flow when drying herbs, as well as low light. It’s ideal to keep them away from dusty areas, but a little dirt won’t hurt. Once the Nettles are dry I put them in a big paper bag, and when I’m sure they’re incredibly dry I put them in a glass jar with a lid to cure. I packed these beauties up last night and decided to keep some of them in a small paper bag so I wouldn’t have to crush them. The rest I crushed lightly into a pint glass jar and closed it up. I am excited to compare the flavor and aroma of each storing method! Just saying Nettles is exciting. It reminds me of their prickly hairs, which I enjoy. In Rhode Island we call it “Seven-Minute-Itch” on account it stings for approximately seven minutes. I think that’s why I like it. The sting is sharp and awakening, but it doesn’t last forever. I have had experiences where it ends up being more like seven-hour-itch, but those occasions are rare. 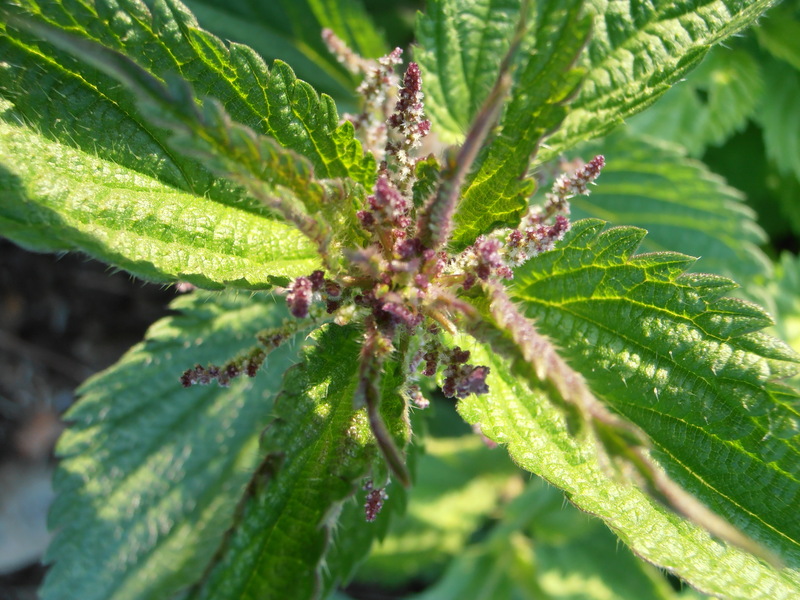 The word Urtica has many related forms in several languages and they all suggest ‘irritation caused by a sting’, Dioica or Dioico relating to the specific gender of each plant. Stinging Nettles comes in male or female. The seeds are medicinal and collected by herbalists. I tend to just use the leaf and stem, but it is common to also use the root. The whole plant has a purpose to people. 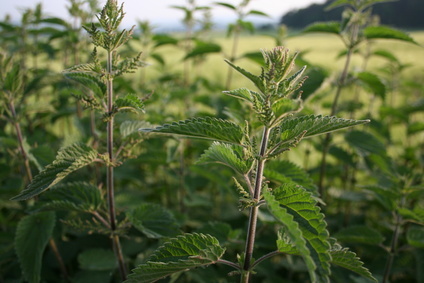 Have you ever experienced Nettles? It’s that first scent of Spring kind of sneezy. The day’s temperatures reach above 40 degrees F and the nights drop below freezing. The trees start to breathe sap through their sleepy trunks and limbs. Just thinking of it runs electricty up my spine! As March approaches like a Lion, and the snow comes and goes, watch the very tips of the Trees. Plump buds may already be there. It’s always the Trees that spark my nose to sneeze and trickle. It’s breath-taking and awakening to be revived through a pollen sneeze -but- it can also cause quite a ruckus. In this case I call upon our dear Sister Nettles. Her irritating hairs cure my irritated nose…in a sense. 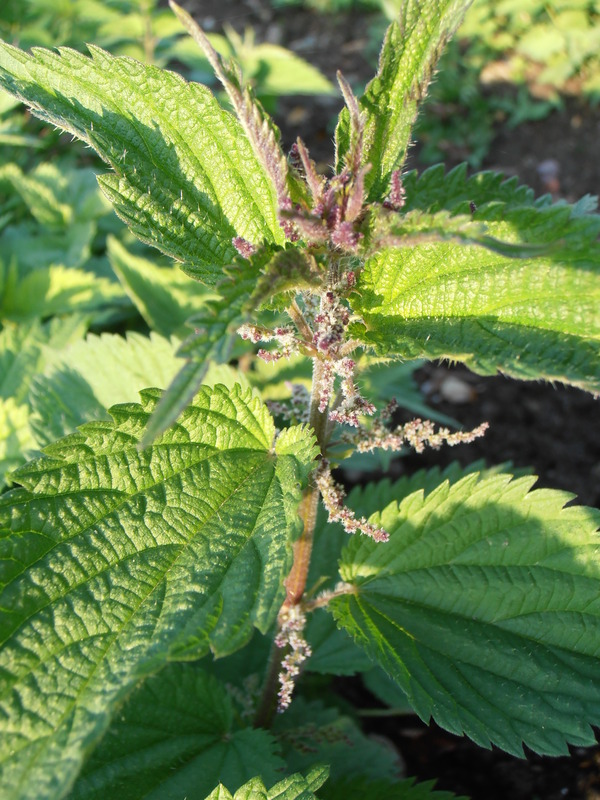 Nettles calms my nose by reducing its production of histamine. When my nose senses a dusting of foreign objects, it produces histamines to protect me. But I love and trust Tree pollen so I am willing to let Nettles relax my nostrils. 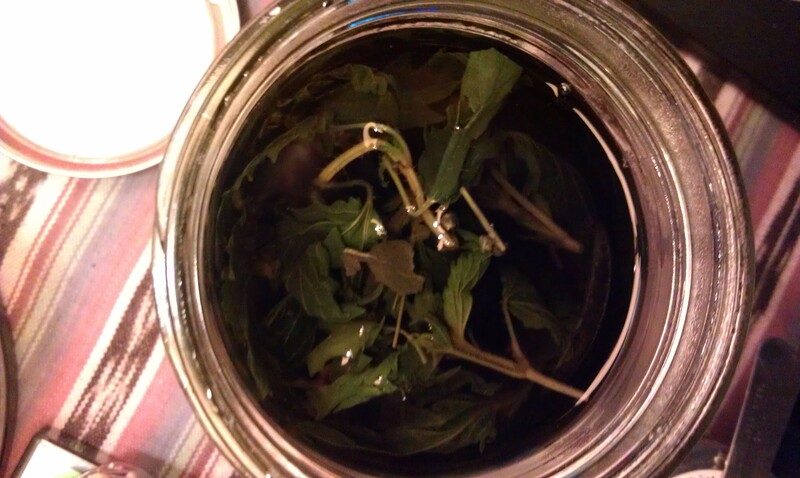 Into your neti-pot* add a cup of strong Nettles infusion, cooled to room temperature, and flush the olfactory. See if that will tame your histamine frenzy. I plan to do it with a bit of Goldenseal included, to kill bacteria on contact. I ran myself a little sinus infection with all that sneezin and honkin. 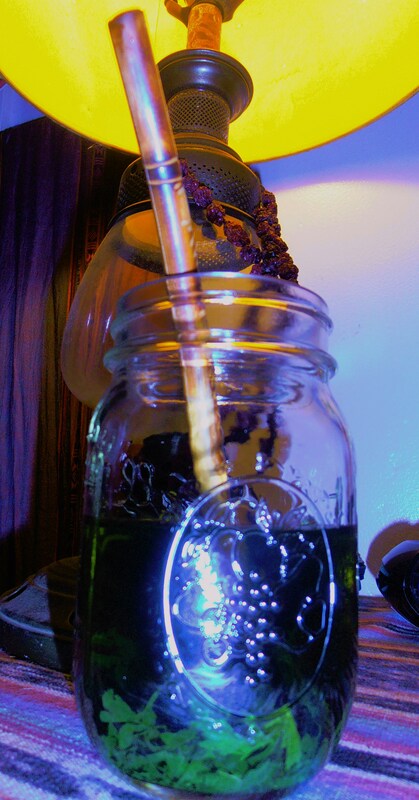 Will an infusion of Urtica dioica (“Stinging Nettles”) , taken as an everyday Tonic, nourish and tone my energy reserves? If I drink a quart of Nettles infusion per week then my energy levels will become balanced throughout the day because Nettles will supply my body with the vitamins and minerals it needs to function properly. My experiment is based on many years of many wise words spoken on the benefits of Stinging Nettle. The plant grows wild in rich soil where it pulls essential minerals into its leaf and stem. These minerals are passed onto your body when you use Nettles as food and medicine. 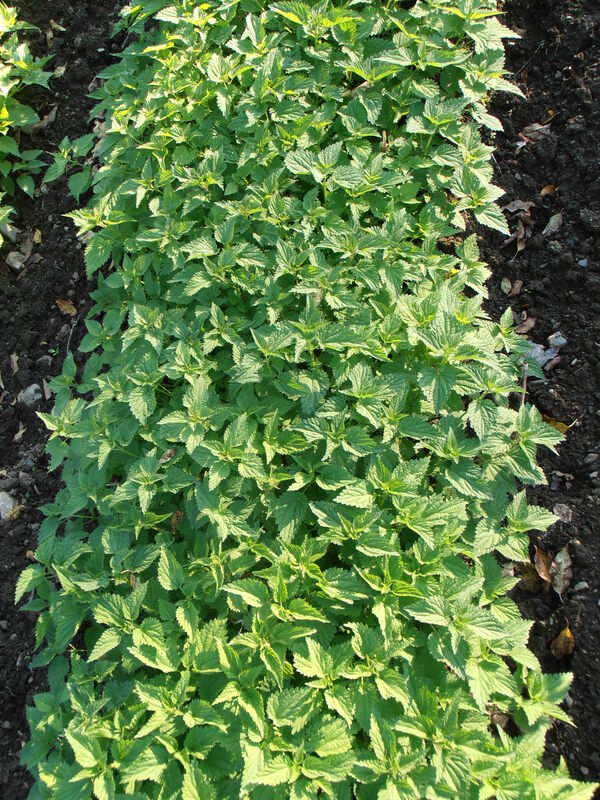 Susun Weed recommends making an infusion of the herb in water to reap the most benefit. 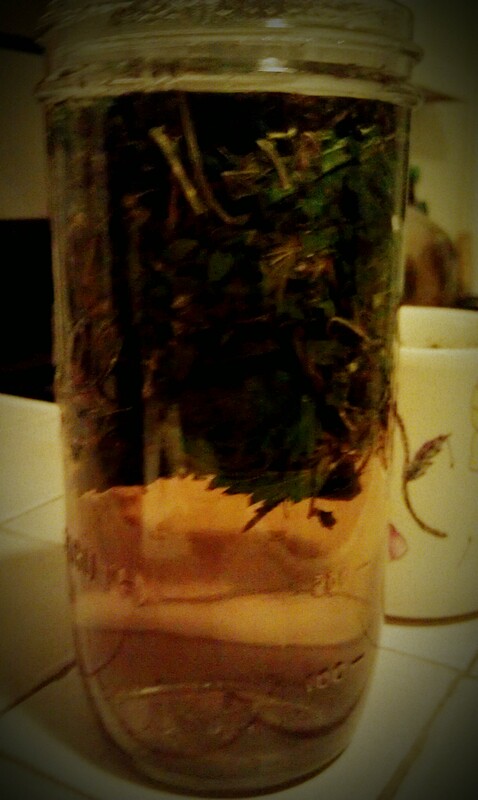 I will drink a quart of Nettles infusion a week to balance my energy reserves. Along the way, I will attempt to meditate with the Nettles Plant Spirit and gain insight into her personality/medicine/uses. Regular journaling will supply data and observations for the experiment. 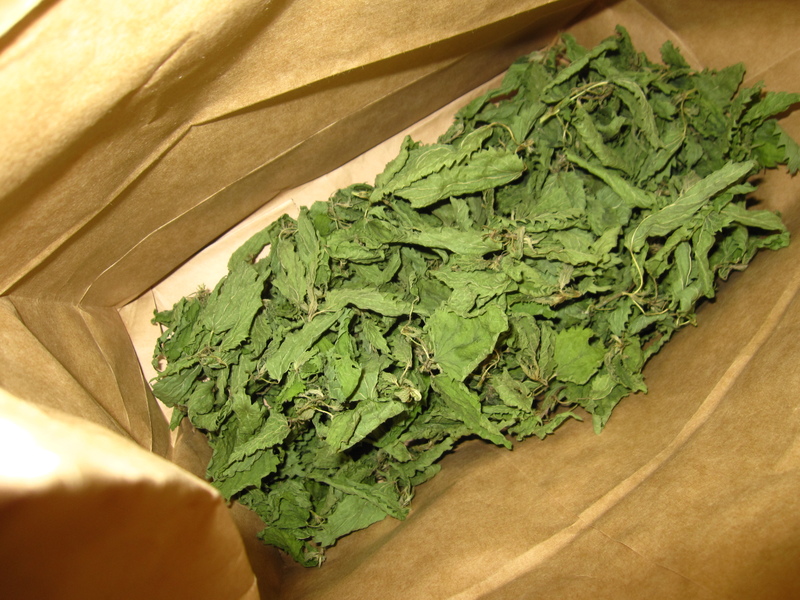 a regular source of dried Nettles. Currently I am using dried Nettles from Zack Woods Herb Farm in Hyde Park, VT and then I will transition into the delicate regrown Nettles tops I collected last Autumn and dried. When Spring arrives and the Nettles make a comeback I plan to harvest and dry more supply. I’d like to further investigate the effectiveness between fresh and dried Nettles, and when using which is most appropriate. An infusion of the Nettles will partially digest the herb, and draw the medicine out into the water so it can be readily used by the body. An infusion differs from a tea due to the length of time the herb is steeped. A tea takes about 2 minutes to steep, but an infusion needs at least 4 hours. 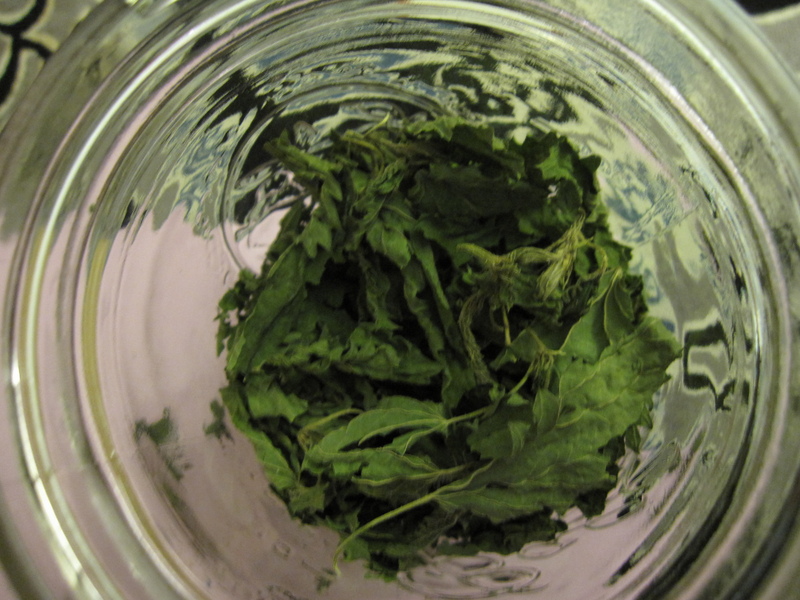 I may occasionally add a heap of dried Nettles to some boiling water in the morning, and then drink it in the afternoon. In this case, I like to bring around my Mate straw which strains out the herb as I slurp. I encourage you all to join me in this experiment. Nettles can be enjoyed by many, and hopefully your local herbalist or Naturopath will agree that Nettles can be your new friend! I recently listened to a ‘tele-lecture’ led by clinical herbalist Guido Mase, through the Urban Moonshine free herbal education series! Guido explained that there are three areas to address when curing the allergy dis-ease: local relief in the upper respiratory – liver function and its efficiency in removing free radicals – and the calming/toning of the Immune system to decrease unnecessary inflammation throughout the body. 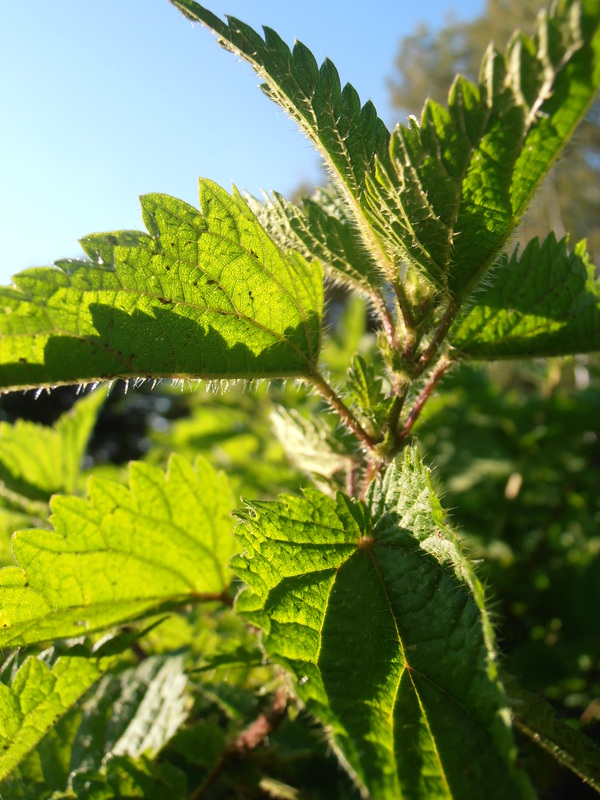 Nettles are part of the local relief – they help to reduce reaction in the face (nose, throat ,eyes, ears, head) with astringency and bioflavonoids. The plant helps to reduce inflammation with its anti-histamine properties. Guido suggested taking a tincture made from fresh Nettles or eating a roll-up of the fresh leaves (though he warned that stinging of the mouth may occur…). Both can be done as needed while symptoms persist. Toning liver function and the immune system are the best long-term way to cure yourself of allergies – it’s where it all starts. If you can increase the efficiency of these organs you can eliminate seasonal allergies all together. 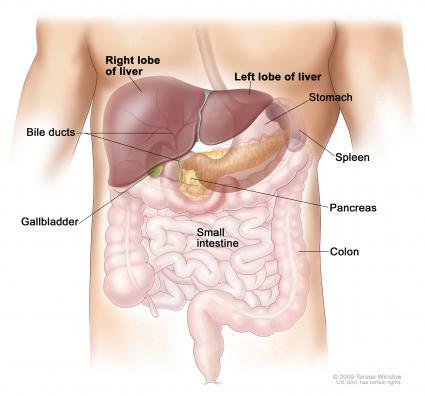 The liver takes the toxins entering the body and turns them into free radicals while breaking them down. This causes floating poisons to clog up the various nooks and crannies of the body-temple. If the liver is functioning properly, it will act more efficiently to combine the free radicals with antioxidants (like pomegranates) to move them out of the body. Thus reducing toxin build up and giving the liver more liberty to deal with unusable foreign objects such as pollen. The immune system causes allergies with its endless production of inflammating histamine. It’s what makes your nose clogged and your eyes water. 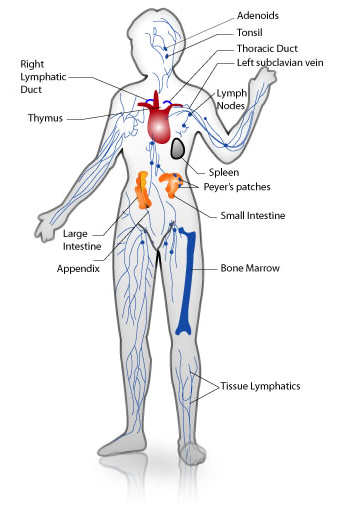 When an antibody-generator (anti-gen) enters the body, the immune system sends white blood cells to attack by building a highway with fluids and inflammation. If you give your immune system a proper toning, it can become less reactive and more “tolerant” to the common allergens. You might still sneeze if you inhale black pepper accidentally, but you won’t be leaky and miserable for 12 hours. Allergies to me, at this point, seem to be a monitor for the liver and the immune system. If you are having allergies, your filled to the brim with toxins (!) and it’s time to clean house. For more lectures from Guido Mase visit Urban Moonshine’s education page, or check out his website. Reading, Reading, Reading. I found myself knee deep in what others have written about Nettles. I’ve seen a few Nettles pop up in the garden. So happy to see them. I’ve been wanting to be stung, and haven’t. I went to find my stash of dried Nettles and they are missing! Am I suppossed to go harvest them fresh? I am thinking I want to eat them…such a waste to have to compost the herb after infusion. To be honest I haven’t been drinking the Nettles infusion as often as I had planned! 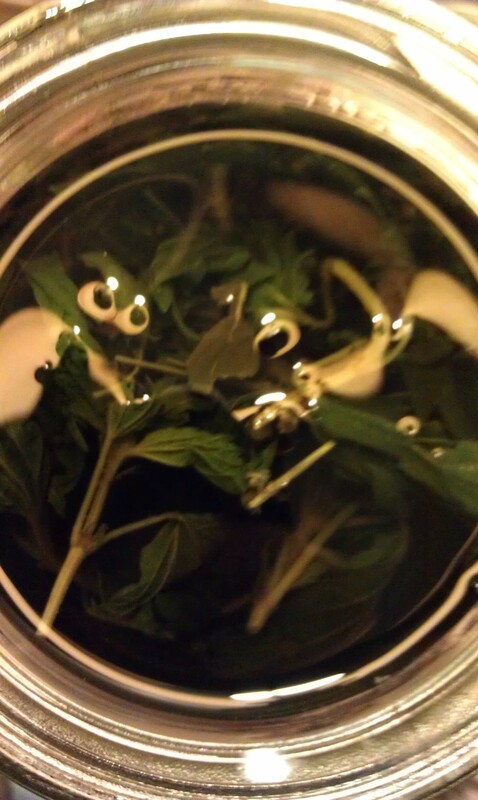 I made one brew with a few different herbs added to the Nettles right before my moon cycle – that was nice. A pint/day seems like not enough once I start sipping. There’s my inspiration I suppose. It is different from the Basil experiment – when a pimple shows up you want to grab something to put on it. The Tulsi I knew instantly made me feel better. The Nettles are more long term – a tonic. It’s learning a new routine. I will go to her this weekend in the meadow. Thought: Nettle’s anti-histamine actions are letting the different body parts function again. An inspiration to become functional again. Maybe this is its same doctrine on the body system, nourishing it completely and allowing for proper operation. Becoming awakened. This is the way of the Nettle. 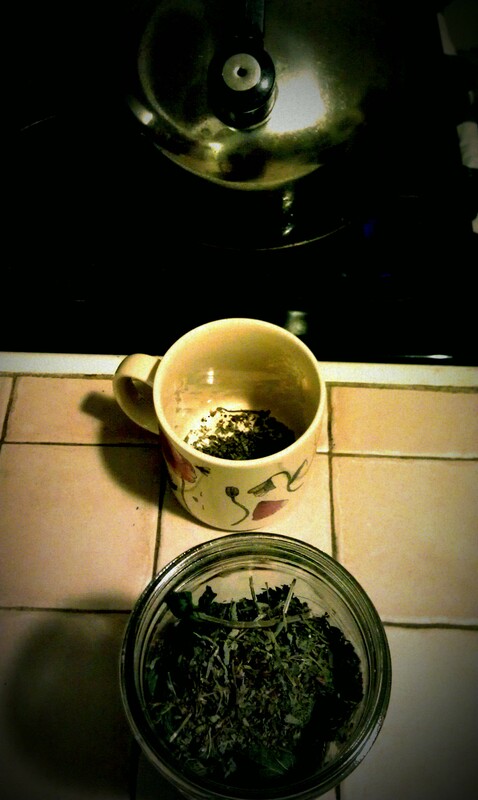 When brewing Tea, I’ve been making myself a now & later (tea for now, an infusion for later). 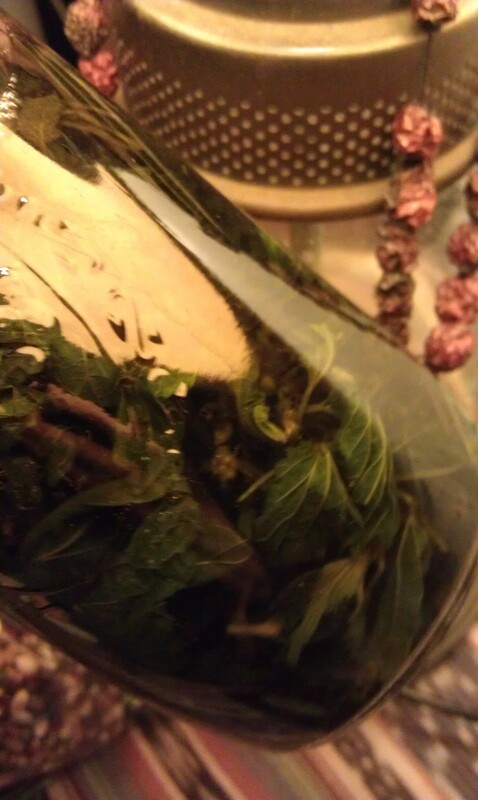 I like combining Nettles and Tulsi to accompany while I write. This year allowed me to gather many knowledge molecules from the Nettle. Now I plant them for you here, to grow and nourish. I have been slowly but surely getting Nettles into my regular routine. 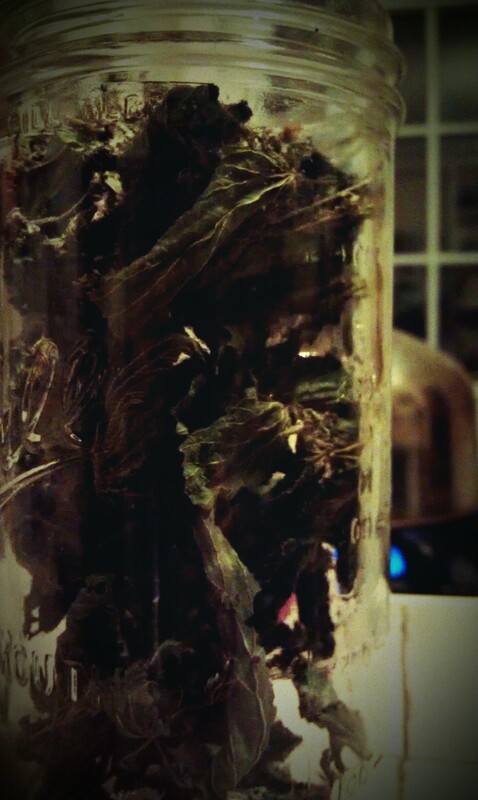 I made my last quart of my dried wild-crafted Nettles from VT tonight. Moving on to a shipment from Mountain Rose Herbs, their Nettles are certified organic and sourced from Hungary (?). I crave the infusion now, and really look forward to drinking it. Comforting. I especially like to drink it the last week of my moon cycle, to replenish the blood and give my body what it needs for the next moon phase. 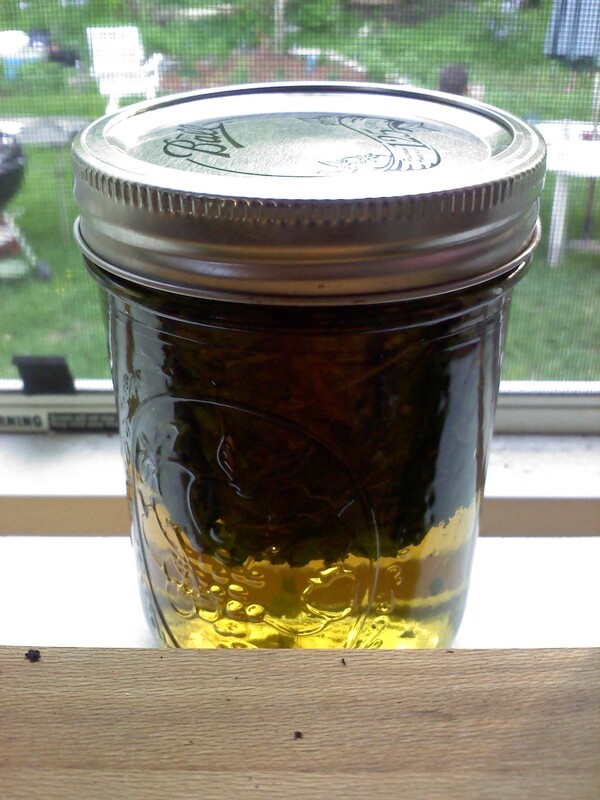 Nettles infusions are also a great tonic for those who need more micro and macro nutrients in their diet. Oh how I love a good Nettles sting! The wake-up shock and continual reminder through itchiness is right up my ally. I’ve connected more so with the Nettles sting than its ingestion. I enjoy dabbing them on my skin, giving a little tap-slap-whip, whenever I came across them in the wild. 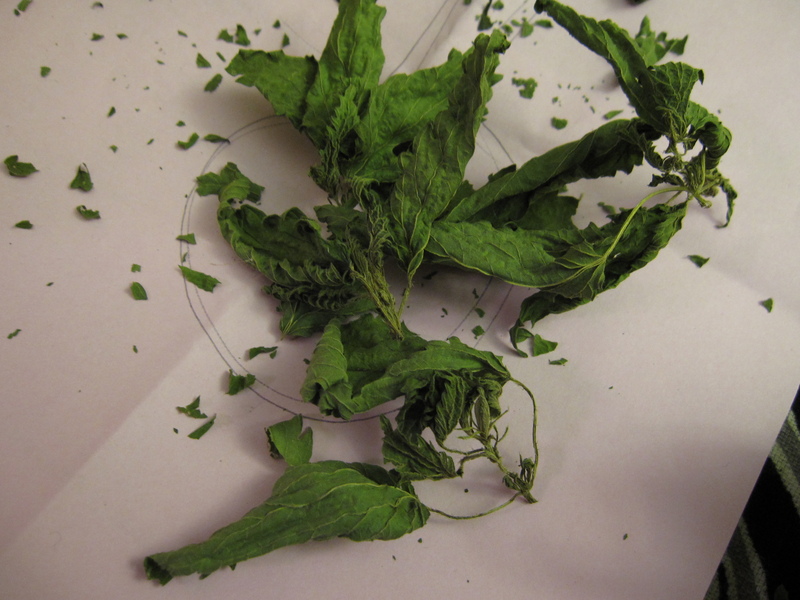 I had an interesting conversation with an artist who experienced a giant Nettle in Australia and was told to avoid it – known to cause demise if the skin is stung or the hairs inhaled into the lungs. I surfed the web and found the plant she speaks of: the Australian or Tree Nettle. It is also a member of the Urticacea family. However, it is of a different genus and species – Laportea moroides, and is not the same Nettles I am discussing here (Urtica dioica). Though I do take caution now and remember this story while working with dried Nettles. Sometimes the Nettles stings ya, and sometimes it don’t. If it wants to it will, and if it doesn’t it won’t. I find the Nettles to be stronger & longer to last. Will brush up against you with a stingless mellow. The sting is present, curative and granting of your wish. You may have heard of Biodynamic Farming, interpreted by Rudolph Steiner. On the website biodynamics.com they describe Steiner’s studies as “the conclusion that western civilization would increasingly bring destruction to itself and the earth if it did not begin to incorporate an objective understanding of the spiritual world and its interrelationship with the physical world. Steiner’s spiritual scientific methods and insights have given birth to practical holistic innovations in many fields including education, banking, medicine, psychology, the arts and, not least, agriculture.” He’s actually quite a hero of mine. And I can relate to his seemingly “kooky” theories (they all seem a bit otherworldly when speaking on speaking to plants…)! Biodynamic Farming is a conscious act of farming with the planetary forces of the Galaxy. In one aspect, you utilize the phases of the moon and its water pulling abilities to maximize your planting and harvesting. For instance, the Full Moon pulls water to the surface of the Earth – so you harvest any fruiting above-ground plants at the Full Moon if you want them to be watery/juicy (like tomatoes!). If you want to harvest roots, you do so during the New Moon when water (and nutrients) are pulled down to the center of the Earth. You can also tie in the location of the planets, etc to further your cosmic gardening. Rudolph Steiner worked with plants on a chemical level, and noticed that certain plants and their ability to gather nutrients had a profound affect on soil processes as well as plant health. He made biodynamic preparations or “preps” that involve putting herbs in the horns of certain animals and burying them on certain cosmic alignment days for so many days, and unearthing them at the exact moment that gives them their highest potential. There is a rhyme and reason behind all of the steps, which, given the time and resources, I could dig. 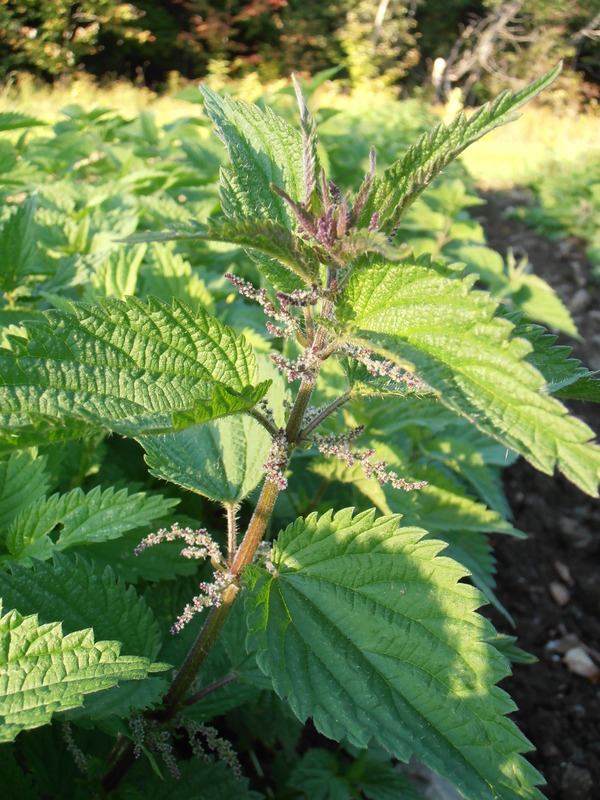 Nettles is an important part of Biodynamic Farming. prep BD504 as they sell it. Makes sense since Nettles prefer to grow in very fertile soil. It’s actually a sign that your soil is in good health if you have Nettles growing. They prefer the yummy soil so they can soak up the nutrients and pass them on to you (and the compost pile!). 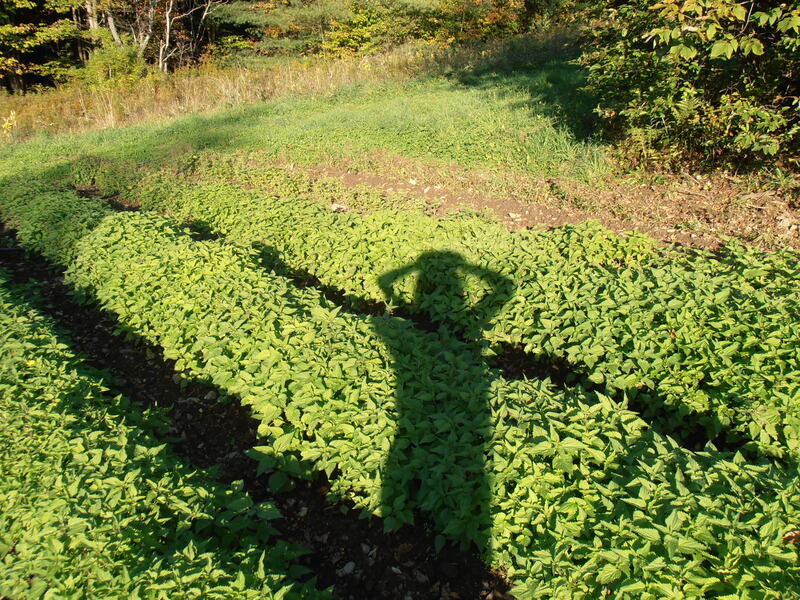 In September I went to Zack Woods Herb Farm in Hyde Park, VT and romped around their fields, meditating with various varieties and seeing the medicinal herbs in farm-cohesion. I joked with the Plant Spirit, in all seriousness, and started giggling while exclaiming “Nettles Hug”. The Nettles at Zack Woods were very sharp and the sting was nothing to mess with. I gave an aura hug to the plant and was stung on the sly quite a few times. It was worth it. I was able to find myself deep in the Earth and amongst the largest patch of Nettles I’ve seen. Thank you to the Vermont herb growers hor holding such a space. I have been fortunate enough to be provoked into meditation by the Nettle for a little short and sweet. A few tid-bits told here and there while walking the woods or enjoying the backyard. The first being the surface meanings: taking time to be conscious of their presence when walking the woods, and knowing that intention can be part of the medicine. 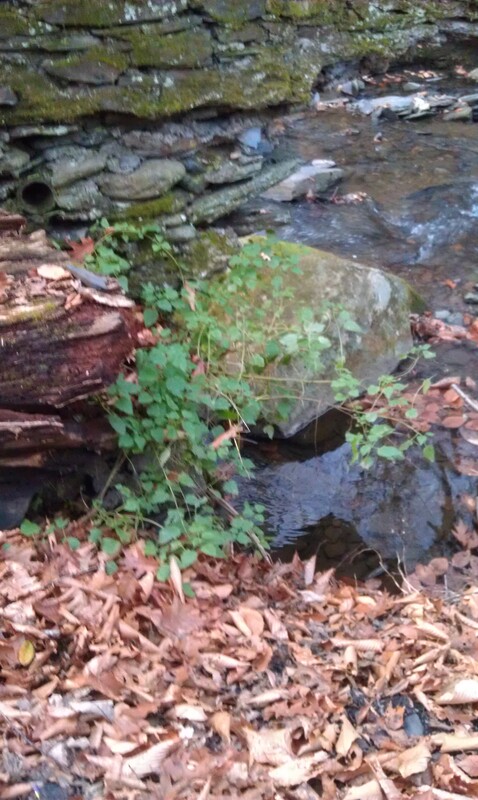 This theme of being conscious mirrors the actual act of meditating with the Nettles. As if the goal of meditating is really to be in the present moment and not to drift off into dream land as often. To have what I need at hand to carpe diem. In conscious waking life, the Nettles meditations gave me the confidence and ability to pass along the wonders of the plant to those who also walk the waking path. Yes. Consciousness. Boom, Shiva! Consciousness and Process. Processing literally as the plant does. Attracting positive nutrients, processing them into its own self, and then releasing through process. The Doctrine of Signatures never ceases to amaze me. I find it useful to connect a plant’s physical features with its healing capabilities by drawing it – and of course I went through a stint of drawing the Nettles plant, passing on her Spirit gift to those who spared paper and pen for the creation. 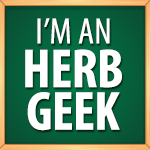 Nettles is an herb that I will continue to bring along with me in life. Our relationship has developed slowly in the Spirit sense, but with great pleasure and passion. My meditations have taught me to appreciate the process. Waiting for the herbs to infuse for several hours – learning the patience associated with getting to know someone or something well – constant nourishment to achieve greatness and optimal health. Writing and processing my thoughts and experience over this past year is wonderful. I hadn’t realized how much I’d learned and felt, how the Nettles brought medicine which coincided with my healing journey over the past year. Twirling, twirling, twirling. Sister Spinster. Softly stroking my face with a sweet loving touch. Not every plant communicates in the same manner: Something an Earth Apprentice learns through many Spirit conversations. Dearest Nettles, you fill my heart and body’s desires. Thank you for being in arm’s length, and showing me where you grow. Thank you for keeping me well and bringing the nutrients of the soil to my blood and soul. Sweet Blessings to you and your kind, may we continue to dance gently along the Earth together.